If you experience breathing problems, you might need to actively treat those symptoms, or you could find that you’re being kept awake at night. 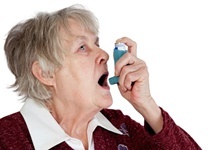 According to a recent Swedish study, asthma sufferers are far more likely to suffer from insomnia than others. Insomnia is a common problem among asthmatics. The researchers concluded by saying that asthmatics should treat their symptoms, including nasal congestion, to make sure that they get a good night’s sleep. Other lifestyle factors, like smoking and obesity, will also increase your chances of suffering from insomnia if you’re an asthmatic. Sundborn, F., et al., “Asthma symptoms and nasal congestion as independent risk factors for insomnia in a general population: results from the GA (2) LEN survey,” Allergy November 26, 2012.